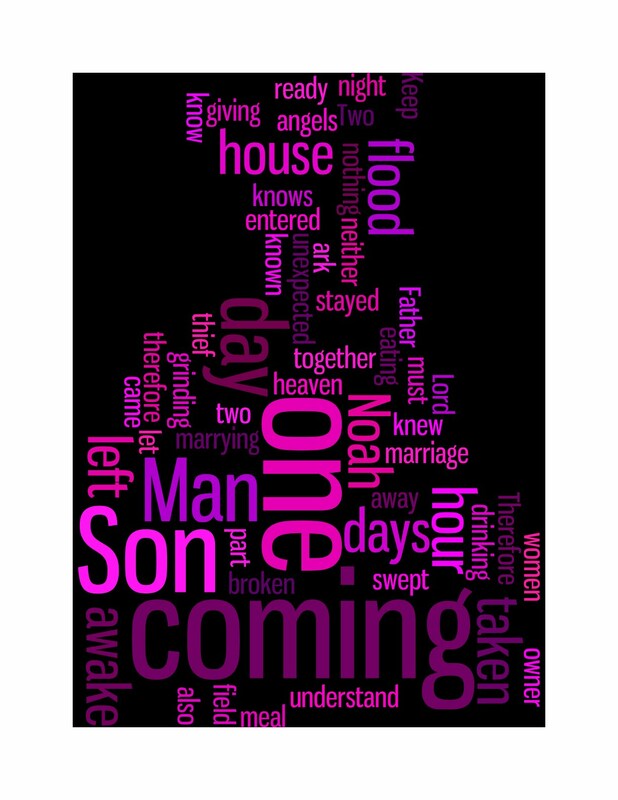 It is interesting to note that the Wordle highlights the words son, man, one and coming. The Son of Man is one who is coming. Ben-adam. The son of Adam. The son of a man. He said to me, Son of man (בן־אדם : [ben-'adam]), stand on your feet, and I will speak with you. 2 The Spirit entered into me when he spoke to me, and set me on my feet; and I heard him who spoke to me. 3 He said to me, Son of man (בן־אדם : [ben-'adam]), I send you to the children of Israel, to nations that are rebellious, which have rebelled against me: they and their fathers have transgressed against me even to this very day. 4 The children are impudent and stiff-hearted: I do send you to them; and you shall tell them, Thus says the Lord YHWH. 5 They, whether they will hear, or whether they will forbear, (for they are a rebellious house,) yet shall know that there has been a prophet among them. 6 You, son of man (בן־אדם : [ben-'adam]), don’t be afraid of them, neither be afraid of their words, though briers and thorns are with you, and you do dwell among scorpions: don’t be afraid of their words, nor be dismayed at their looks, though they are a rebellious house. 7 You shall speak my words to them, whether they will hear, or whether they will forbear; for they are most rebellious. 8 But you, son of man (בן־אדם : [ben-'adam]), hear what I tell you; don’t be you rebellious like that rebellious house: open your mouth, and eat that which I give you. 9 When I looked, behold, a hand was put forth to me; and, behold, a scroll of a book was therein; 10 He spread it before me: and it was written within and without; and there were written therein lamentations, and mourning, and woe. Son of man here appears to be a title referring to the humanity of the author, much how the word "human" may suffice in English. It is not a respectful appellation, but a humbling one (in some cases, an arguably abject one), and this use is a consistent pattern throughout Ezekiel. In other words, the son of man, is a downtrodden figure that the prophet Daniel then links with a divine figure, the coming Messiah, a theological link that was strengthened during the time before New Testament. In the New Testament, Jesus uses the term in similar ways, but some think he might just be referring to humanity generally. Thanks for this (rare) piece of useful sanity in blog and twitter-land today. surely it is (if you take the original meaning) the "new humanity" that is coming, not just a longing for it? Aren't we moving towards fulfilment in either meaning? God wants us to be free to be the people we long to be... is I think what you say. But shouldn't we be hoping/longing to be the people that God made us to be, rather than letting our own desires dominate? Or am I reading you wrong? 'adam of course is not gender specific (see http://jamesthevicar.com/wordpress/2008/07/29/adam-male/) so ben-adam could be rendered "Son of humanity" or "born of human" or something along those lines. This brings to life the state of the whole of humanity and so the enormity of what is wrought by the "new adam" - the new human.